How does being a Christian make a difference to the work and life of an academic? For those Christian scholars who work in biblical studies, theology or church history, it can be relatively straightforward to see how being a Christian and working in academia can fit together. For the rest of us, the jigsaw is not as easy to complete. As a doctoral student I worried about whether I was being “Christian enough” in my approach to my studies and, if I’m honest, I wondered if being a Christian was making any difference at all to what I did and how I did it. In the course of struggling with these issues I came up with a threefold schema that I found helpful in working through just how my studies and my commitment to Christ fit together. Here’s the schema. There are three ways in which being a Christian can make a difference in an academic life. At different moments of our academic journey we may well find that one of these ways is dominant, and it may well change over time. In some disciplines and working environments, one will almost always be more prominent than the others. Contacts: the human contacts that my lecturing job or research position brings me. It’s about relationships: who is involved in my work. This might include colleagues, administrators, people I correspond with, the person who cleans my office, or people whose books I read, and last but by no means least, my students. Context: Here I’m thinking of the way that I approach my work. This is not specific to working in any particular field. It is the “how” of my work. Content: Here are the nitty-gritty details of my particular academic discipline, the “what” of my work. How do I take a Christian approach to the particular material, the particular questions I am considering as a researcher? 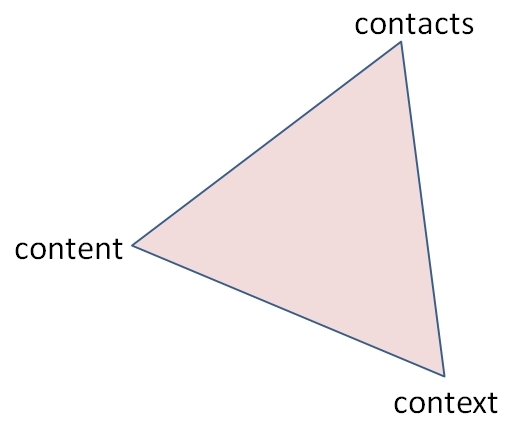 The three areas can be represented as the three points of a triangle. As you progress through your academic career you will move about within that triangle as a function of the difference that being a Christian makes to each of these areas. For example, most people starting out in a secular academic field find that, for the first few years at least, being a Christian doesn’t make much difference to the content of their work, if any at all. After all, they are mastering the area and not yet in a position to critique it authoritatively from a Christian point of view. It takes time to gain the right, and the expertise, to have a voice at the table, and we shouldn’t be expecting to transform the discipline in the image of Christ right from our first published paper. This should not mean, however, that being a Christian is making no difference to our academic life, because in terms of contacts (treating everyone we meet at the university with respect, not just those senior to us) and context (not plagiarising, being generous and fair in our interpretations of other scholars’ work) Christ’s fingerprints should still be all over our academic life. Where are you in the triangle at the moment? Where would you like to be in a year’s time?